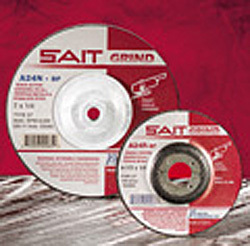 Sait Fast Grinding A24N are the United Abrasives grinding wheels providing quick action. They are made of aluminum oxide, a course grain size and a soft bond allowing for fast stock removal. 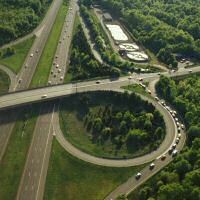 Applications: Ferrous Metals such as iron, steel and welds as well as low grade stainless steel. 9" diameter, 1/4" thick, Type 27 (depressed center), 5/8" bore, with hub. For right angle grinders. This product was added to our catalog on Thursday 19 February, 2004.